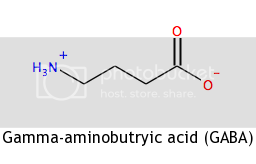 Gamma-aminobutryic acid (GABA) is the main inhibitory neurotransmitter in the brain. A neurotransmitter is essentially a molecule that one neuron sends to an adjacent neuron in order to excite or inhibit it from sending a signal. 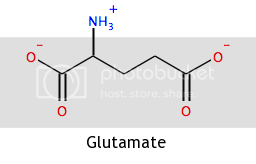 While GABA is the main inhibitory neurotransmitter in the brain, glutamate is the main excitatory one. Glutamate and GABA compete, in a way, to drive neurons to be more or less active. In general, altering glutamate or GABA levels in the brain can have global effects on the organism. A drop in GABA level or an increase in glutamate level, for instance, can cause seizures; likewise, a drop in glutamate level or an increase in GABA level can cause drowsiness or even coma. This was an interesting experience, to say the least. No, I did not notice any relaxing or sedative effects beyond those I normally feel after drinking tea, but this tea is not all novelty, as it has some interesting and potentially enjoyable gastronomic properties. First, some quick background. As I have mentioned once or twice before on Tea Nerd, nitrogen flushing is a good preservative for tea, as it displaces oxygen and slows down the post-production oxidation process. In Japan, in 1986, it was accidentally found that exposing raw tea leaves to an anaerobic (no oxygen), nitrogen-rich environment caused the concentration of GABA inside the leaves to increase, and thus the creative term "GABA tea" was coined. The Japanese apparently developed a fondness for the beverage, and Taiwan began tweaking its method of production to increase GABA content and improve flavor. 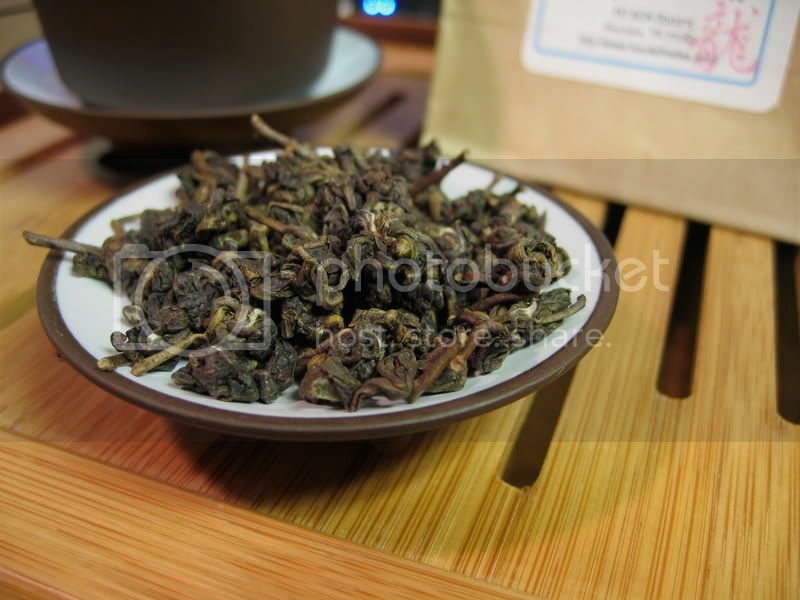 GABA oolong has since become one of Taiwan's major exports, according to Hou De. 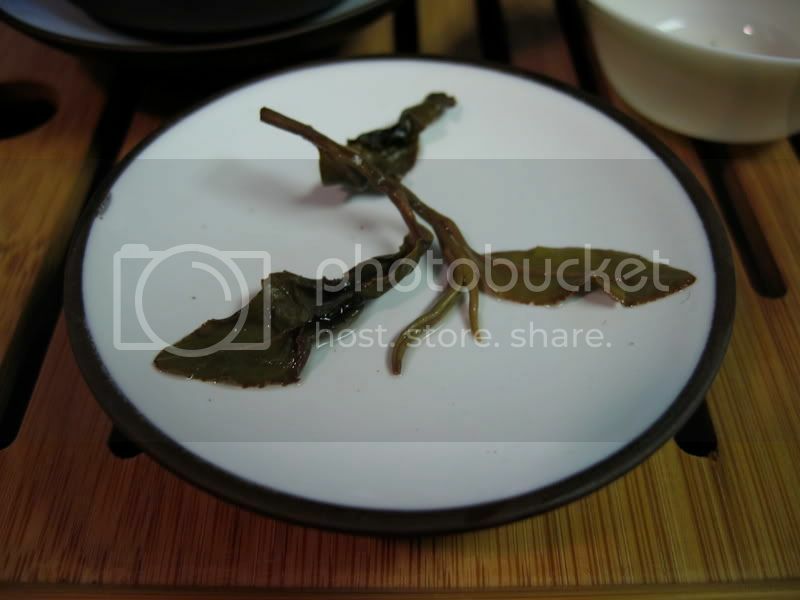 The dry leaf, as the Hou De product page describes, has a strong mango and guava fragrance. I also thought I picked up a bit of peach, but it's hard to say when there are so many different fruit aromas simultaneously assaulting my brain. Actually, the fruit fragrance was SO powerful that it was a little overwhelming (in a not-so-great way) and made this tea's nose fairly unbalanced. As for looks, you can see from the picture that they are nice little rolled-up balls, which is pretty standard for Taiwanese teas. There is very little green here—most of the leaves are shades of tans and browns. The liquor brews to a nice light brown, which I have tried to capture here. It smells very similar to the dry leaf, and tastes like it smells. There are strong mango and guava flavors, a nice sweet aftertaste, and a smooth feel especially in earlier infusions (interestingly, some of the earlier infusions taste similar to sweeter second flush Darjeelings). A bit of an artificial taste comes out in the later infusions. Overall there is not much that tastes bad about this tea, but I don't think the flavors are well balanced, as the fruitiness dominates completely. One more thing that I noticed here was that the tea had a long-lasting drying effect, but in the absence of anything I would normally call astringency. It was odd, and felt like I was eating flour. I'm a bit weird and actually enjoy eating flour, so this wasn't a bad thing in my opinion. The wet leaves didn't smell all that different from the dry leaves, although I swear I caught a slight whiff of menthol or camphor (nothing like what can be found in puerh, though). It is a very pleasant aroma—definitely enjoyable. Then I dug into the leaf pile. The leaves are still attached to their stems, for the most part, which is a sign of hand-picking. However, it was fairly stemmy and sometimes I noticed that the 3rd and 4th leaves were attached to the stem in addition to the standard 2 and a bud. I could be wrong (please correct me if I am), but I have read that the lower leaves are of inferior quality. Still, as Salsero has reminded me, it's more about the taste than the little nitpicky things. Overall, I thought it tasted quite decent. Maybe not incredibly complex, but certainly drinkable. Personally I would have enjoyed this tea far more if it were not for the unbalanced flavor profile, but if you are looking for an intensely fruity unflavored tea, this is the one for you. Back to the biology behind GABA (woo hoo!). Earlier, I mentioned that altering GABA and glutamate levels in the brain can have generalized effects on the overall activity of the brain, and GABA tea works on this principle-- more GABA = more inhibition. However, a far more common (and effective) method of altering GABA's activity in the brain is to modify its receptors' function. You all know of chemicals that increase the activity of GABA receptors/ion channels (I won't go into the details of how ion channels work in neurons, but you can google or wikipedia it if you like), though you might not know that this is how they work. The most common examples are alcohol (ethanol, to be specific) and benzodiazapines (such as Valium), but there are many more. These molecules cause the GABA receptors to produce stronger effects in the cells they are attached to, and thus bring about a relaxing, drowsy sensation. While we're on the subject, L-theanine is also known to affect the GABA system, though in a different way. While ingesting GABA is not a very effective method of increasing GABA levels in the brain, L-theanine causes the brain to produce more GABA itself. This is much more effective and is the reason why tea does not give as harsh a caffeine buzz as coffee. I'm thinking of doing a more in-depth post about L-theanine later, so keep your eyes peeled. Though GABA tea does seem to have mild effects on the GABA system in the brain, it is not nearly as potent as some other substances due to its inefficient method of action (it probably takes the single most difficult path to the brain). So, you won't get sleepy by drinking it, but it's still kinda cool. Now, make sure you remember all of this— it will be on the test. I have to remember not to read your blog before breakfast/tea. Having said that, the agony induced by such mental taxation on an unprepared brain certainly shakes off the shackles of sleep, and so perhaps it's a positive thing. I had no idea that such "GABA teas" existed. How would you compare its fruitiness with, say, a super-fruity dancong? Or a Sezhong? Intriguing! Unfortunately my experience with the different varieties of oolong is quite limited, so I'm not able to answer your question. I will be receiving a few dancong samples in the next few weeks though, and if I remember, I will let you know how they compare. I didn't take detailed notes during my tastings, so I don't have specific numbers for you. I think I started around 20s with 175°F water, and moved up from there in later infusions. 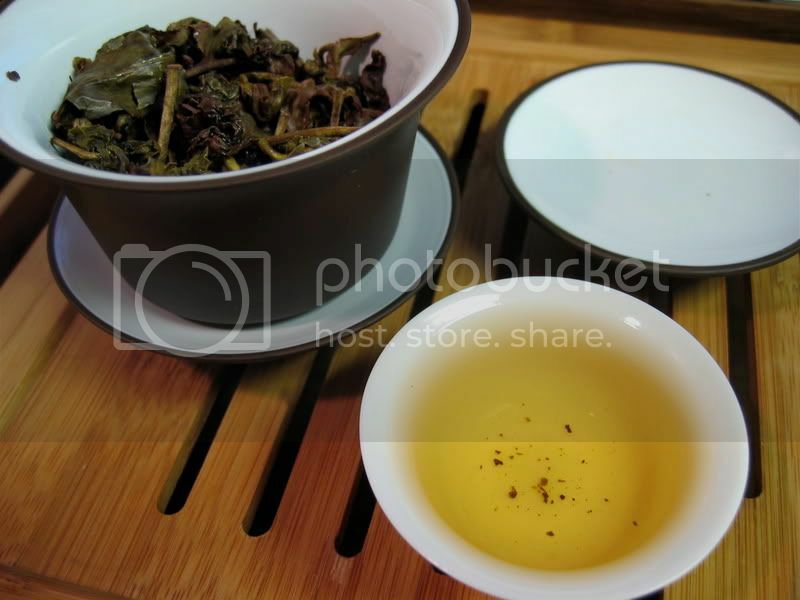 As for how much leaf I used, I just eyeballed it, but I'd guess around 4-5g in a 90mL gaiwan. I did a few tastings like this, and got consistent results. Tea and chemistry fit together. Arr, how can I link tea and computers? I can't think of any algorithms that would describe the taste. I suppose my hobbies are mutually exclusive, save the whole blogging thing. I like the tidbits of neuroscience thrown in these posts. Maybe I'm nerdy but I like that part the best. Moar! I second EO's 'moar' roar! I've been wanting to read more about the physiological effects of L-theanine for awhile now, but lacking access to databases and journals (and factoring in my laziness, of course) my self-motivation has given me a consistent "Meh." on the subject. I just got a few ounces of this and was very unimpressed. The flavor is poor, and, as you pointed out, one-dimensional. Very lacking in the complexity that I look for in higher (and by higher, I mean over 15-20% oxidization) roast Oolongs. That being said, I brewed up an extra strong batch after my initial tasting. After a few small sups my eyelids began to flutter and I was out cold within 15 minutes. I can not help but feel that I felt something other than those sensations I would have felt with any other tea. More Guinea-pigging is needed, however. ...I found it a very pleasant read :). Keep it up, it's fascinating! ... and indeed, Brent, I'm quite sure they were intended as compliments. I finally tried my sample of this tea tonight. Ian is certainly correct that it tends to the uni-dimensional, but that dimension is pretty unique. I found it hard to believe it wasn't somehow flavored. The fruit flavor was very pronounced and insistent from first brew to last, the Juicy Fruit of teas! No Dan Cong or Se Shong that I've had even comes close to this level of fruit. Great article, as usual :) I got some of this as well and was quite surprised. I had previously purchased some GABA tea from TeaFromTaiwan.com, and absolutely hated the stuff - very dark and thick, with what Hou De seemed to be referring to as a "compost" like flavor. I did notice a lot of fruit flavor in the Hou De stuff, but what I got wasn't particularly unbalanced - actually a bit lighter than a dancong, but similar in taste IMO (just without the citrus notes, and less of an "edge"). I actually thought it was much more nectarine than mango, but I can see why people would say that. 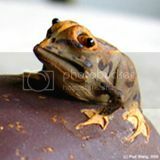 If you want something with the noted "sedative" type effect, you might check out number 611 (Formosa Fancy organic) at specialteas.com. It's not always noticeable, but on tense days it can be. Anyway, good stuff, keep em comin! Great scientific background on GABA. Nice work!